FEATURING:Oshikiri mdl HM1300DE 1300 Lb Cap Industrial Mixer s/n 70026D. Tortilla Manufacturing Line w/ Ruiz Extruder, 50″ Sheeter Make-Up Line with Flour Sifters and Rollers, 4-Station Die Cut Carousel and Take-Off Conveyor, Ruiz Gas Fired Oven, Arr-Tech mdl. G38-40F Counter/ Stacker s/n A02021-814. Tortilla Manufacturing Line w/ Ruiz Extruder, 46″ Sheeter Make-Up Line with Flour Sifters and Rollers, 4-Station Die Cut Carousel and Take-Off Conveyor, Ruiz mdl. KFO-4814 Gas Fired Oven, Arr-Tech mdl. G38-40F Counter/ Stacker s/n A02020-813. Tortilla Manufacturing Line w/ Ruiz mdl. E39-15 Extruder, 40″ Sheeter Make-Up Line with Flour Sifters and Rollers, 4-Station Die Cut Carousel and Take-Off Conveyor, Ruiz Gas Fired Oven, Arr-Tech mdl. G38-40E Counter/ Stacker s/n 302. Tortilla Manufacturing Line w/ Ruiz Extruder (N0 Extrusion Nozzle), 38″ Sheeter Make-Up Line with Flour Sifters and Rollers, 4-Station Die Cut Carousel and Take-Off Conveyor, Ruiz Gas Fired Oven, Arr-Tech mdl. 38-4 Counter/ Stacker s/n 195.Ruiz Food Equip. 35″ Sheeter Make Up / Die Cut Line w/ Flour Sifters, Rollers, 4-Station Die Carousel, Take-Off Conveyor. Ruiz Food Equip. 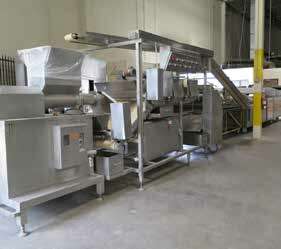 33″ Sheeter Make Up / Die Cut Line w/ Flour Sifters, Rollers, 4-Station Die Carousel, Take-Off Conveyor. (2)Arr-Tech 53″ Counter / Stackers. Arr-Tech mdl. 38-40 38″ Counter / Stacker s/n 277 (2)Ruiz Food Equip. mdl E36-15 Extruders (No Nozzles) 36″Tortilla Press w/ PLC Controls. 36″ Pass Thru Gas Fired Oven (No Hood) Loma Metal Detection System s/n KIMD10704 w/ Loma IQ2 Controls, Pneumatic Ejector. Safeline Metal Detection and X-Ray System s/n 23894-01 w/ Safeline/Mettler Toledo Digital Controls, Pneumatic Ejector. (3)Safeline Metal Detection Systems s/n’s 8469-2A, 13756-01, 13756-02 w/ Digital Controls, Pneumatic Ejector.Pacemaker Packaging 16″ Automated Bar Sealing Machine. Die Cut Rollers and Carts. Amada RG-100 100 Ton x 10’ CNC Press Brake s/n 10150 w/ DRC Dyna Bend I Controls, 122” Max Bend Length, 100.5” Between Uprights, 15.76” Throat. 3.94” Stroke, 13.79” Open Height. Standard mdl. AS250-12 250 Ton x 12” CNC Power Shear s/n F5051401 w/ Siemens Simatic Panel Controls, 12’ Squaring Arm, Front Supports, Foot Control. Tuda Seisakusho “TudorMax 23X118” 23” x 118” Geared Head Gap Bed Lathe s/n 6VP-20019 w/ 21-1500 RPM, Inch/mm Threading, Tailstock, Steady Rest, Dorian Tool Post, 16” 3-Jaw Chuck. 1997 Cadillac / Yang mdl. YANG-CL56150G 22” x 60” Geared Head Gap Bed Lathe s/n B92876 w/Tailstock, Steady Rest, 13” 3-Jaw Chuck. 2005 Webb Champ mdl. 4VR-HC Vertical Mill s/n 9410939 w/ Sony DRO, 3Hp Motor, 60-4200 Dial RPM, Chrome Box Ways, Power Drawbar. Bridgeport Vertical Mill s/n 183592 w/ Mitutoyo DRO, 1Hp Motor, 8-Speeds, Chrome Ways, Power Feed, 9” x 48” Table. Stanimuc “Supermill” mdl. 3U Universal Mill s/n 335766 w/ 25-1500 RPM, 50-Taper Spindles, Universal Milling Head, Power Feeds. Cincinnati No.4 Horizontal Mill s/n 4A4P1Z-107 w/ 18-1300 RPM, 50-Taper Spindle, Power Feeds. W.A. Whitney 630-Fabricator 30-Ton Punch Press s/n 630-750-39334 w/ Punch and Nibble Mode, Fence System, Tooling Cart and Punch Bases. Amada CS-220 10 Ton 8 5/8″ x 8 5/8″ x 1/8″ Hydraulic Corner Notcher s/n 544357. Pexto 36” Slip Roll w/ Stand.